To download the flyer, click the image above. 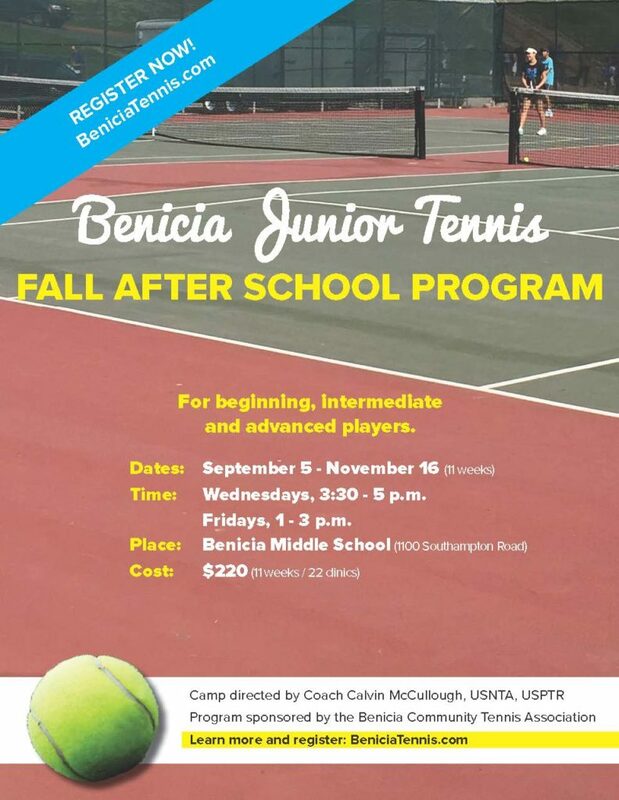 This Fall 2018, the Benicia Community Tennis Association will be offering a fall after school tennis program to Benicia Middle School students. Beginners will learn the fundamental strokes, footwork and the rules of tennis. Intermediate and advanced players will focus on consistency, improved footwork, tactics and strategy. It’s a great way to help our juniors polish their skills, learn new ones, and stay active all while enjoying a sport they will play for a lifetime. Time: Wednesdays, 3:30 – 5 p.m. and Fridays, 1 – 3 p.m. The camp is directed and taught by Coach Calvin McCullough “Coach Mac,” along with multiple assistant teaching pros. 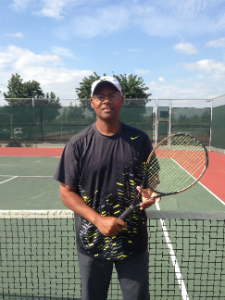 Coach Mac is a United States Professional Tennis Registry (USPTR) registered Level One Pro and a United States National Tennis Academy (USNTA) tennis instructor with over 20 years coaching experience with juniors, high school teams, and adults. He is also a certified United States Tennis Association (USTA) referee and umpire. Did you know that proceeds from our junior tennis clinics help fund improvements on the tennis courts at Benicia High School and Middle School? The juniors participating in these clinics are not only staying active, having fun and learning a sport of a lifetime, they and their families are supporting long-term access to tennis for our community. Thank you! Payment can also be made online via the link below. Any questions, please contact Jojo Donetti at jdonetti@gmail.com.